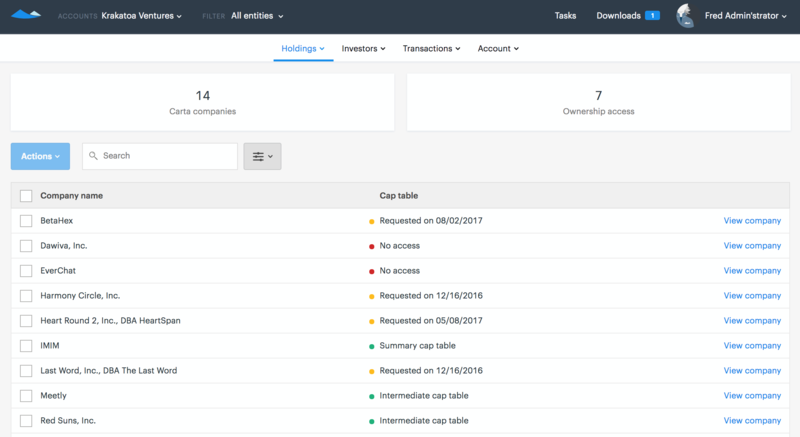 Investors on Carta can request access to company cap tables when they accept securities. On Carta, company cap tables are updated upon any securities transactions. In this way they are always current and accurate. The cap table request goes to the individual(s) that the company has selected to handle investor access requests. To request cap table access, select the company and click Actions > Request cap table access. The company can choose from several different levels of access to provide. Once access has been granted, you will have access to the company's real-time cap table as of any date in the company's history, such as a quarter-end or year-end for reporting purposes. In addition, if you have detailed access, you can utilize our round modeling and waterfall analyses based on the company's cap table data.